The Planning Notepad by John Krissilas: Cool Out-of-Home Series #4, Part 2: Mystery Solved! Cool Out-of-Home Series #4, Part 2: Mystery Solved! The "Mystery Box" is no longer a mystery. Was its secret worth the wait? 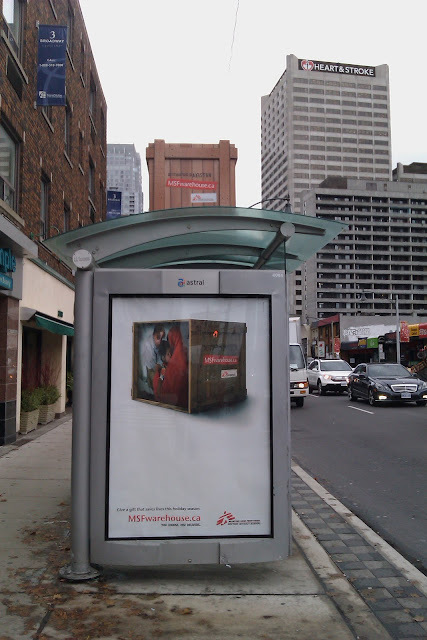 A few weeks ago, I wrote a post (click here to read it) about a mysterious box that began to appear on transit shelters throughout the city of Toronto. 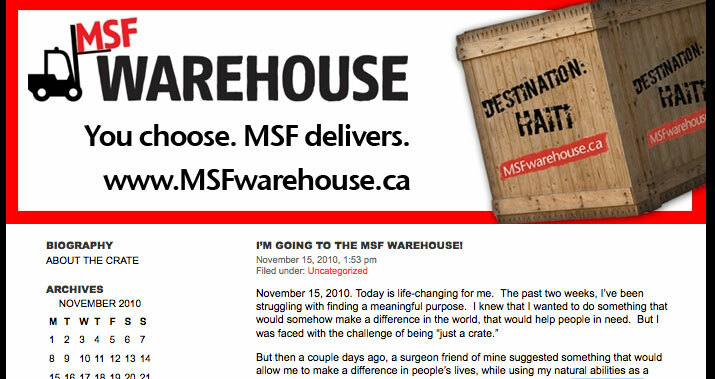 After following the mystery to the indicated website, Whatsupwiththecrate.ca, I discovered the blog of an unfortunate crate, forced into a never-ending job search after getting laid off. The crate kept us abreast, with wry and self-effacing humour, on how its hunt was going on pretty much a daily basis. You could even follow the crate's adventures on YouTube, Twitter, and Facebook (and yes, I did "friend" it). Well, as you can see in the photo above, our friendly neighbourhood crate has finally found a career with meaning. 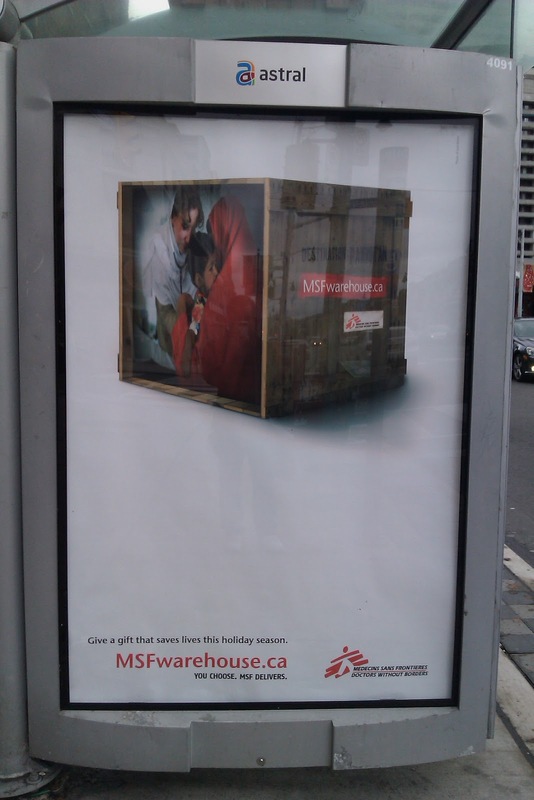 What better job for a crate than the responsibility for storing and shipping valuable medical supplies for doctors and relief workers helping people in need abroad?? So, what's my take on the big reveal? I have to say, I'm a bit disappointed. I loved the intrigue and mystery of the intial build-up - the eye catching transit shelters and the question any bystander would be thinking: "What's up with the crate?" I felt engaged (and strangely, compelled) by the blog documenting a hapless crate's quest for employment. But the final result? Mehh... I love the juxtaposition between the meaningless jobs the crate applied for (and wasn't good at) and the meaning that comes with a job that's about helping others. But that connection also requires a lot of work on the consumer's part in terms of keeping up with the blog and getting a sense of what the campaign is all about. I feel like when you're dealing with a charity that we don't hear much about, and a cause that's worth talking about, you have to be much more direct and harder-hitting. You have to pull on people's heart-strings, make them compelled to pull the trigger on a donation. This is especially true during the holiday season. Why not take a page out of the World Wildlife Fund or World Vision's book and put a gift-giving spin on the cause? The other disappointment is the creative execution of the campaign's final destination. It feels extremely bland and, for lack of a better word, boring. Almost too Amazon-like in its appearance and functionality. They seem to have forgotten that donating money to a charity is a very emotional experience - it's supposed to make you feel good, not like you've completed a transaction. If that wasn't enough, the most compelling part of the "What's up with the crate?" build-up - connecting with a human-like crate who's sort of a lost soul - is completely lost on this new website. 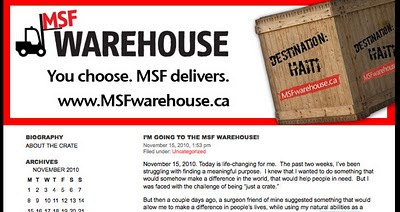 Rather than acting as a guide or as the "face" of the cause, the crate disappears entirely. Not good.